Famous for her solid relationship with her former top ride Limelight de Breve, Laura has made her way to the forefront of show jumping with sheer determination, patience and hard work. Laura is currently Britain’s leading lady and is enjoying success on the international circuit with a string of talented horses, including Oz de Breve and Roller Coaster. 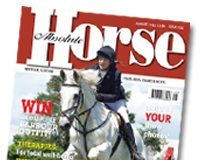 In this issue Laura shares her figure-of-eight exercises with Absolute Horse Magazine readers.